My shopping is pretty well done. This week will be all about baking. And eating what I baked. Yep, my Jillian Micheal's DVD is still playing strong. So this week I'm wondering, what was your favorite gift ever? 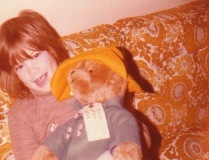 Mine was my Paddington Bear I got when I was four. Paddington hung out in my preschool class that year and one lucky person each week got their name drawn from a hat and got to bring him home for the weekend. On his weekend home with me I fell in love. I was heartbroken to give him back. And that year for Christmas I opened up a Paddington of my own--who, might I add, I still own. He may not still have that hat, he's missing a few buttons from the coat and that tag is long gone, but he's tucked away safely at my house. Anyone else out there still holding onto a gift they received years ago? well, you have outed me! my favorites were always the Christmas music boxes. The search for a different one with a different Christmas carol each year was so much fun and I couldn't wait to wind it up and start it playing as it sat on Santa's letter to you kids. It was playing as you all ran down the hall shouting for Dad to hurry up...he always made you wait for him to shave! (it was his joke to get you all so excited!) It gives me such joy to see them at your houses when we come over at Christmastime...you all have your favorites at your homes now and I don't have to pack them up and store them, a win win! It was a very special memory:) I loved those music boxes!! My favorite childhood present was an orange-colored portable record player. My favorite albums were Shaun Cassidy, Disco Duck, and Frosty the Snowman. I still have the records, but not the record player.